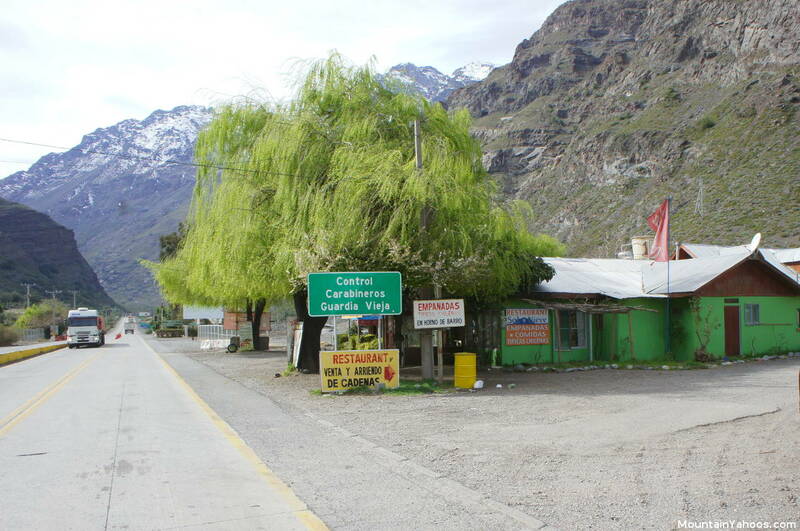 Portillo is conveniently located 93 miles (149 km) from Santiago International Airport. The drive up is scenic and unique. 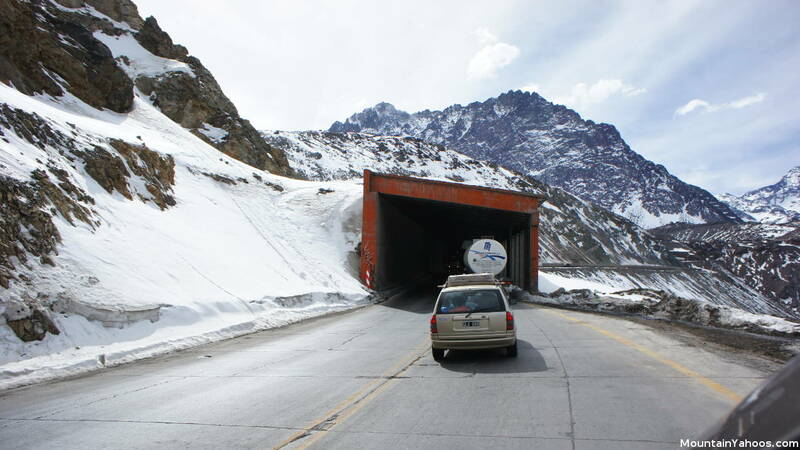 The drive starts with the very typical airport highway exit through the outskirts of Santiago, followed by a drive through the countryside of farms to a gentle ascent up the Andes along the Rio Blanco river valley to a weavey road of 26, 180 degree switchbacks which zig-zag back and forth till you arrive at your destination, Portillo ski resort. 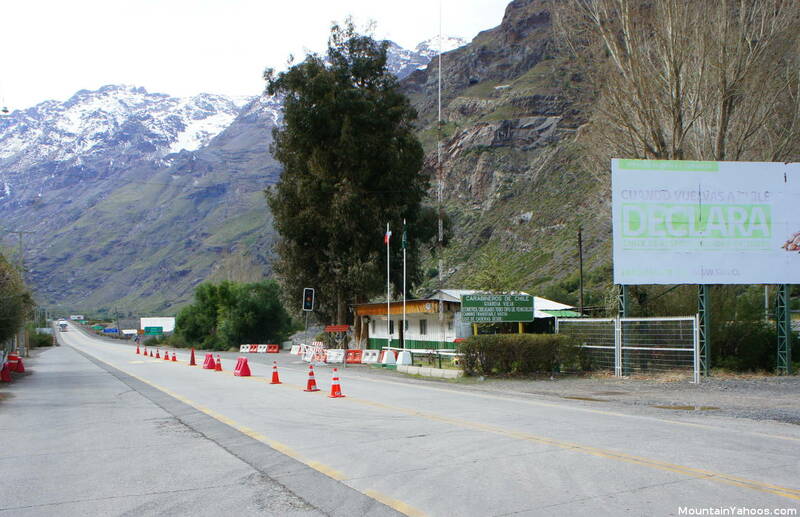 The highway 60 "Chile Old Guard" police control point on the way from Santiago to Portillo. This is where they close the highway from 8:00 pm till 8:00 am. During operating hours, automobiles are generally waved through without any need to stop. Highway 60 on the way from Santiago to Portillo. Road follows the Rio Blanco river. The roads are paved and in good condition. Portions of the highway are covered in avalanche prone areas (a lesson for Lake Tahoe and Caltrans). The biggest drawback is the congestion due to slow moving trucks, putt-putting along as they navigate the switchbacks at high altitude. Altitude and thin air are a key nemesis of the internal combustion engine and the generation of power. 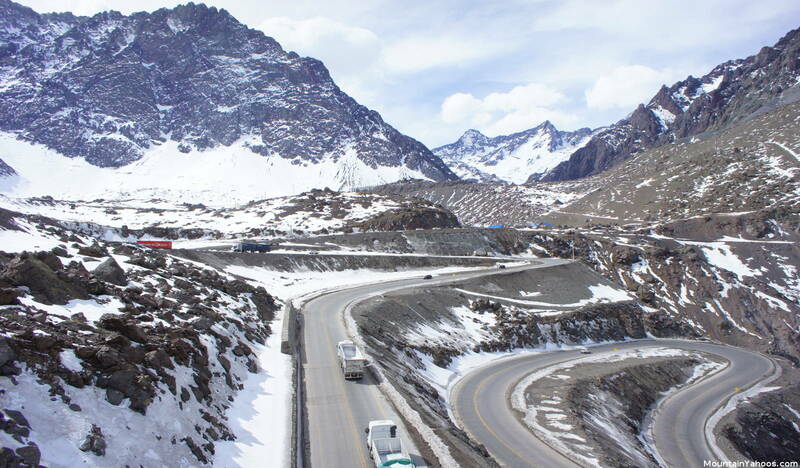 The highway is a major trade route between Argentina and Chile but is only one lane in each direction. There are many shrines to those who have died on this road, so don't take unreasonable chances trying to pass the large trucks. The large transport truck will win in a head-on collision every time. Highway 60 on the way to Portillo - Avalanche sheltered road. Highway 60 has no guard rails but generally does have a generous shoulder and is in good condition. Highway 60 on the way to Portillo - a GPS view of the windy road. 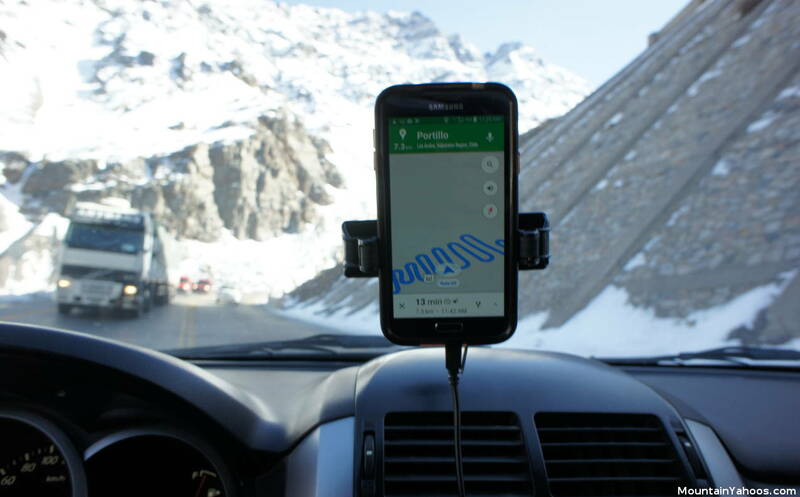 If you have no cell phone data service in Chile, view maps in the region you want to travel to before the trip, when you have wi-fi access. Zoom in and out on all regions of interest. This will cache the map image tiles for use when on the road. Tire chains may be a necessity which can not be determined until one approaches the resort at the higher elevations. Some, but not all rental car agencies will rent chains with the car as an option. 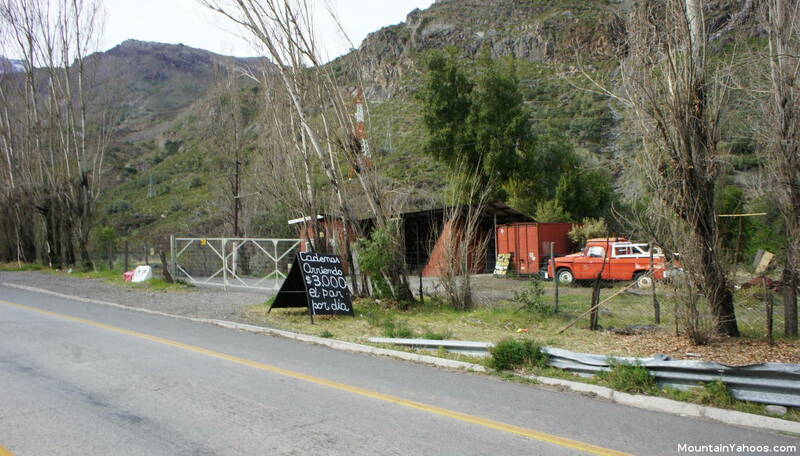 Our 4x4 Suzuki from Chilean Rent a Car had a small daily fee of $5.00 USD for chains. GPS is also an option (same price). The vehicle rental fee included a toll tag which essential if you want to drive around Santiago and check out the city and certainly helpful on the drive to Portillo. 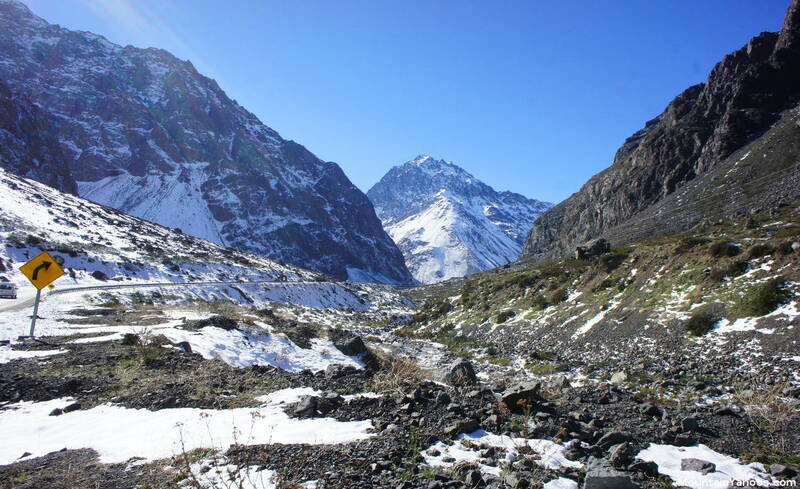 If you want to venture over the mountain range to Argentina, there will be more paper work and applications to fill out. Unfortunately the approval is not immediate and you will have to report back to the rental car company 24 hours after filling out the application. It also can not be done in advance. Pro Tip: FM reception is limited to non-existent for most of the drive. Bring some tunes. For those who forgot to rent chains or they were not available from your rental agency, there are multiple road-side options. 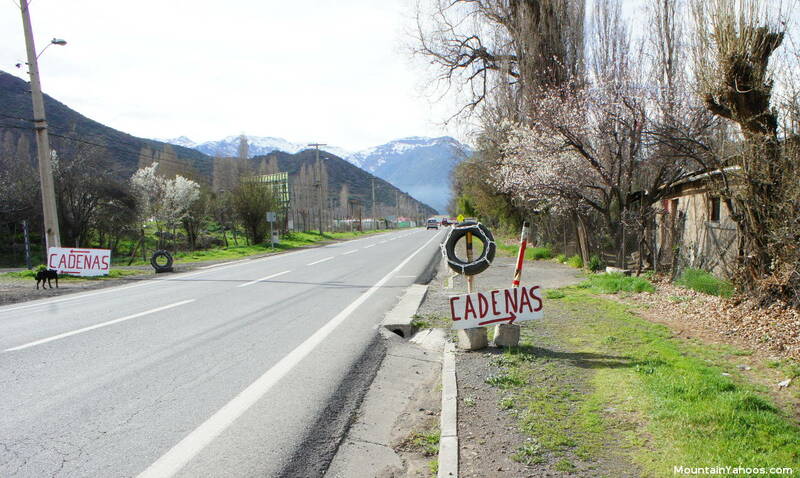 Look for the roadside signs for "Cadenas Arriendo" which directly translates to chain rental. Highway 60 tire chain rental on the way to Portillo. The last highway 60 tire chain rental on the way to Portillo, just before the checkpoint gates which close the highway. 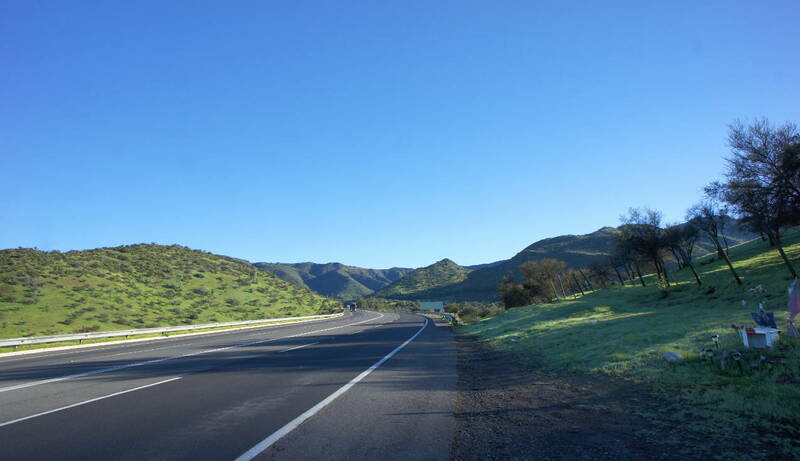 Located in the middle of nowhere but still driving distance from the Santiago International Airports. From Santiago Comodoro Arturo Merino Benitez International Airport (SCL): located 93 miles (149 km) Northeast of SCL, about a 2 hr drive. Highway 57 will eventually turn right and become highway 60 North. Note that there are tolls and a toll tag is your best and most convenient option. Portillo has a lot at the base of the mountain near the hotel. If snow coverage is adequate, there is additional parking at the base of the Juncalillo lift off of highway 60, just before reaching the Hotel Portillo.